G. is possibly the most refined creature I know –with drawers full of bespoke lingerie and shells groaning with books, she is a scholar in the guise of a courtesan, worthy of the 1001 Nights… When I first met her, she wore JAR Jardenia, which I’d never heard of at the time, and owned a stash of vintage fragrances, including several sealed bottles of the original Rumeur and Narcisse Noir. 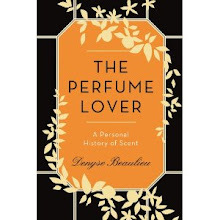 After having lost touch with her for four years, I ran into her recently and was eager to learn which fragrances she currently favored. She answered that there were none: she smells the “chemical soup” in the new ones, and the intense eroticism of the vintage ones take her to emotional places where she would rather not go. As she can’t live without fragrance, she scents her skin, clothing and house by burning woods and resins sent to her from the Middle East. When she opens her coat or moves about, you can catch faint whiffs of the fumes. With its orange-mandarin-cinnamon facets, Myrrhe Ardente is the brightest – it has the warm glow of burning ember and, with its vanilla, the edible quality of a boiled sweet (for more, please refer to my earlier review). Ambre Fétiche is somewhat more matte, with the fattiness of those amber lumps you buy in Marrakech markets to keep in filigreed boxes; the cinnamon sweetness of benzoin adds its softness; a layer of vanilla links it to the myrrh, but what saves Ambre Fétiche from veering into confectionery is a lashing of leather (provided by styrax) and the mineral, smoky suffusion of incense, which link it in turn to Encens Flamboyant. Though the myrrh first seduced me because of its quirkiness, I have now fallen rather violently in love with Encens Flamboyant, the darkest and least sweet of the trio. There is something warm, burnt, almost charred brought on by the adjunction of black pepper (oddly, that same almost gunpowdery pepper note makes a fleeting appearance in another favorite, Chanel 31 rue Cambon). The pepper lends the incense a facet that hovers on the edge of comfortable funkiness; Encens Flamboyant has the depth and comfort of a raw leather chair worn smooth by age in room where incense has been burning for decades. I have been spraying this on my fur coat in the bitter cold of the Canadian winter: though there are no animalic notes in it, it makes me feel like some mythical animal curled up by a campfire, perhaps on the trail of the Three Wise men… But this lioness can lie down with the lamb. The Orientalists are currently available in limited edition flacons, candles and body care at Annick Goutal. 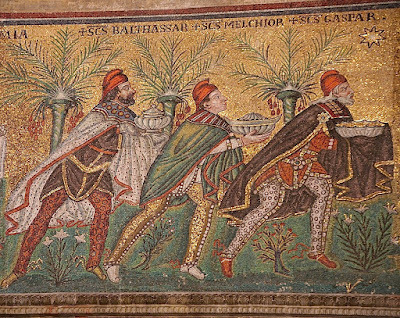 Image: Mosaïc of the Three Wise Men, from a late 6th century mosaic at the Basilica of Sant'Apollinare Nuovo in Ravenna, Italy , Wikimedia Commons. Brava, D...what a beautiful, evocative portrait. When I first heard about these scents, I thought they would be completely beyond my ken. A combination of time spent sniffing, the realization that there are incense and spice scents that I enjoy, and your review are going to draw me toward exploring them. I absolutely agree about Encens Flamboyant. I've fallen hard for it too. And gosh, I hope I never feel the way G. does about my vintage lovelies! Thanks for another lovely post! 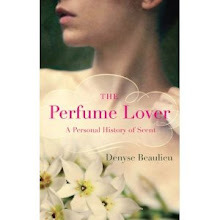 ScentScelf, I can't "do" all incenses: though I love the note, they are more associated to places and occasions than skin. Goutal's is an exception. Not because it's better, but because it's clicked. I should mention that I "accidentally" found two that intrigue me, one of which has absolutely clicked: Nu (wore it today, intriguing), and Black Cashmere (oh, yes...). That's "accidentally," as in I wasn't searching for incense, but one way or another, they came my way, I tried them, and voila. Only BC has truly seemed like it, to use your very apt phrase, belonged on skin. ScentScelf, I'm ashamed to say I only smelled Black Cashmere once... I guess I'm a very Franco-centric perfumista! I am ready to remedy this situation forthwith! Contact me!! "violently in love" describes how I felt about Incense Flamboyant as well; I wasn't far behind on the others..
Tom, those are my two favorites as well. I'm heading off to buy a full bottle of the incense, and resisting the thought of getting the candle too. It's interesting, to Tom's point, then how violently young women (20-30) in America react against strong incense accords. I wonder if it's that way in the Emirates, too. I say get the candle. I love AG candles with their whimsical decorations. Well, Cait, I could always stop eating... For a week?